One moment, the beaches were clear, sandy and beautiful, the next, they were flooded with brown salty smelling seaweed. Within one day, all sun bathing, castle building and beach splashing ceased. For a tourism town, this invasion was an unwelcome interruption though not unexpected. Annually or bi-annually, sargassum seaweed flushes towards the coastline, flooding bights, beaches and bays, filling each with meters deep brown floating seaweed. Once beached these slime nets turn smelly, and become an inconvenient nuisance for beach swimmers, snorkelers and boat engines. For everything (marine life) and everyone else (divers), these floating islands are a dream. Sargassum Seaweed is a marine plant with gas sacs [fronds], floating the plant to the surface, ultimately increasing sunlight exposure [photosynthesis]. The plants are often found in huge tangled mats drifting across the ocean, though with a changing current or moving storms, these tangled messes will invade shores. When they are blown atop a reef, they add miscellany and diversity, due to the countless juvenile fish and crustaceans that hitch a lift and use these golden floating islands as a food source, nursery and resting haven. Turtles are often found supported amongst the tangle, while eels, shrimp and other reef fish hide and spawn below the surface. When the seaweed eventually loses its buoyancy, it sinks to the seafloor, providing energy and completing a feedback cycle in the form of carbon and food to the fish and invertebrates in the deep sea. Undeniably the seaweed has ecological importance and is currently recognized as an “Essential Fish Habitat”, by many marine conservation institutions. Once beached, crabs and insects go crazy for the sargassum, which in turn increases activity amongst shore birds. Even humans have capitalized on this natural event. 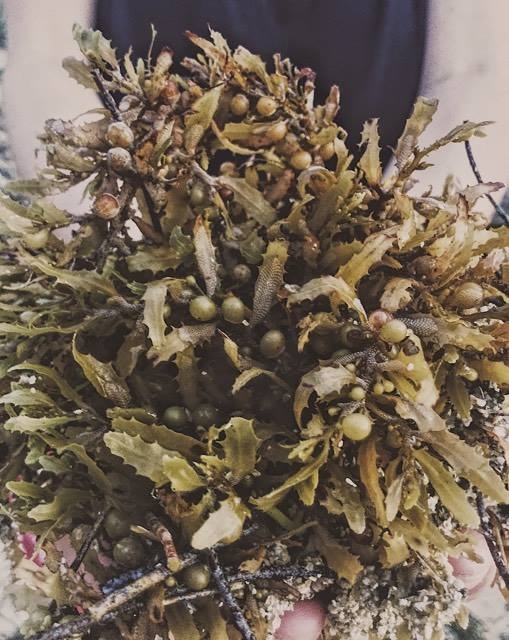 The marine plant can be harvested to feed livestock, serve as biofuel and is additionally cultivated and cleaned for use as a herbal remedy in ancient Chinese medicine that aims to resolve “heat phlegm”. The heat of discussion surrounding beached sargassum has escalated, as the frequency of these beached interruptions have recently increased. The argument being made focuses around the algae blooms growing out of control. Potential contributing factors of this bloom can be attributed to warmer temperatures, pesticide runoff, oil spills and other toxic waste donations. As is typical, the conversation comes back to human impact on the environment and the activities which influence environmental cycles, while humans are left to discuss, react and adapt to the fluctuations of nature and her own balancing techniques. Resident Hero, Gay, raking mounds of sargassum a several years ago. Photo generously shared by Casey Pook via Facebook. When sargassum invaded Half Moon Bay, locals gathered and coordinated to scoop and remove the meters deep seaweed from the beach, manually into wheelbarrows and dug sand holes. Even a couple boys from Coconut Tree were seen helping out and nursing their shovel blisters later that day. The beach is now clear, with all regular beach activities resumed. Though gone it is not forgotten. Using events like these, which interrupt the natural flow of day to day activities, is a great way to remain grounded and to reconnect to the natural processes that govern our ever evolving planet. Mumby, Peter J. “Stratifying herbivore fisheries by habitat to avoid ecosystem overfishing of coral reefs.” Fish and Fisheries 17.1 (2014): 266-78. Web. “Sargassum Seaweed (Hai Zao).” Chinese Herbs Healing. N.p., n.d. Web. 28 Mar. 2017.